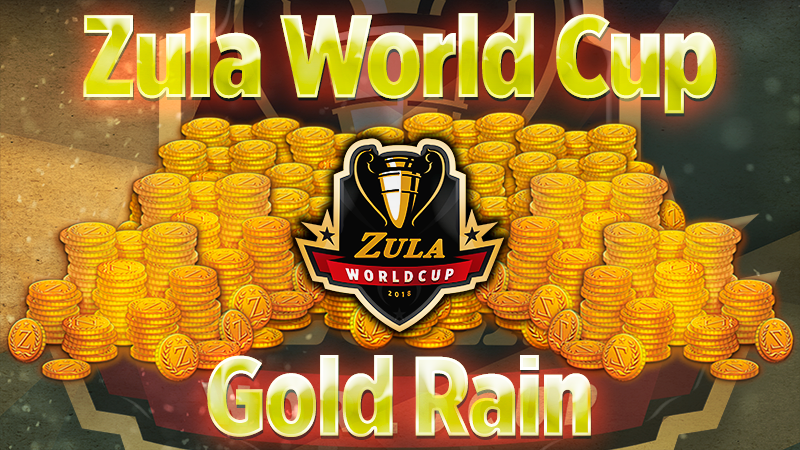 Zula World Cup Gold Rain! - 200.000 Zula Gold Pack + 20 Golden Decks-> +40% extra Zula Gold. IMPORTANT: Offer valid on 07/04/2018 from 00:00 (CET) to 23:59 (CET). - 160.000 Zula Gold Pack -> +35% extra Zula Gold. IMPORTANT: Offer valid on 07/04/2018 from 00:00 (CET) to 23:59 (CET). - 100.000 Zula Gold Pack -> +30% extra Zula Gold. IMPORTANT: Offer valid on 07/04/2018 from 00:00 (CET) to 23:59 (CET).